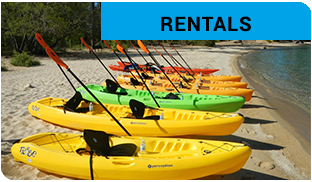 Sand Harbor Rentals offers rentals for single and tandem kayaks, paddleboards, & sailing kayaks. We also have guided kayak tours & paddleboard lessons. * We have discontinued our jet ski rental program as of 8/1/13 due to rising insurance and maintenance costs. We open in May on the weekend before Memorial Day. We close in the fall when the weather dictates, but will accept reservations for larger groups or tours after this date (weather permitting). We often switch to a 10:00am to 5:00pm schedule before June 15 and after September 15th because of the off season. Come explore the wildest, most undeveloped shoreline that Lake Tahoe has to offer. With hidden beaches, secluded coves, white granite boulders, and warm sand, the East Shore is the place to get away from the roads and hotels. Most of the East Shore is public land, but inaccessible by car. Stop by Sand Harbor Rentals and find a little slice of Tahoe for yourself! PARKING WARNING: Arrive early!! Sand Harbor State Park is very popular and has limited parking. They do not allow walk-ins, and there is no on-street parking outside the park gates. During peak weekends and holidays (mid-June through mid September) the parking lot often reaches max capacity within 1/2 an hour of 8am, when the park opens its gates. Arriving at or before 8:am is always a good idea. We recommend that our customers arrive no later than 8:am on these summer weekends and holidays, and no later than 8:45 during midweek days in peak summer. If you arrive too late to enter the park by car, the “East Shore Express” bus from Incline Village can shuttle you in every 20 minutes after 10:am. 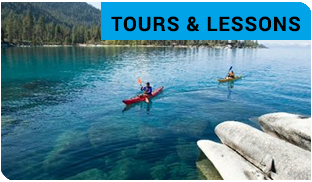 Kayak & Sup Rentals – Enjoy the majesty of Lake Tahoe while kayaking in one of our high-end demo rentals. 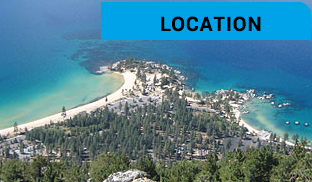 We have two on-water locations to serve you in Tahoe City California and Sand Harbor State Park in Lake Tahoe. Kayak & SUP Lessons & Tours – We have many different Kayak Tours to offer, as well as Stand Up Paddleboard Lessons. Our tours leave from multiple locations around the lake including Sand Harbor. Our Location- You can find us under the white tent at Sand Harbor State Park’s Boat Ramp. Sand Harbor is located on Hwy 28. Use the main entrance to Sand Harbor State Park, not the boat entrance.